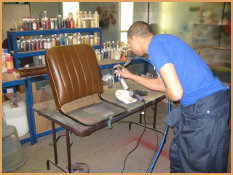 We provide specialist car leather re-trim services for both modern and classic cars. 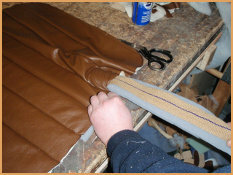 As leather specialists, we don’t always have to re-trim the full interior. We can custom match panels or seats to blend in with the rest of the leather in your car; this can help save lots of time, money and retain the authenticity of a classic car. Panel replacement to match the rest of your leather. Re-pad sagging and out of shape seats. 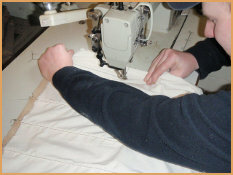 Custom make seat pads in any shape or size. Replace with modern materials or with traditional spring and horse hair. 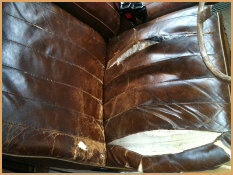 The photos above are from a classic car with very badly worn leather seats. 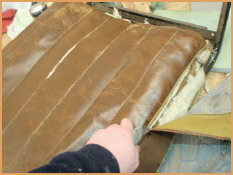 The seams have burst open and the leather has badly cracked, this car is beyond leather restoration so we decided to re-trim. 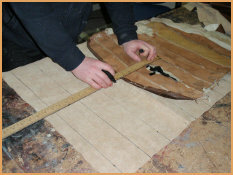 The first photo shows the damage before, and the second and third photo's are of one of our upholsterers cutting out and measuring the new leather panels. 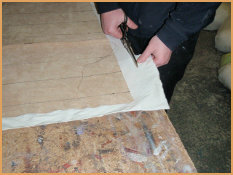 When all the panels have been cut, they are sewn together on the sewing machine in the original fluted pattern. We then cut thin strips of foam and push these into the flutes to provide added comfort and to highlight the flutes. 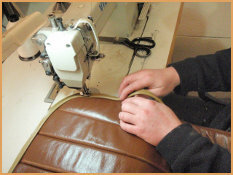 The last part is sewing the piping onto the leather and then re-upholstering the leather to the original seat framework. 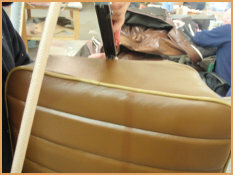 You can't buy leather to match old seats properly so we colour up some raw leather to match. 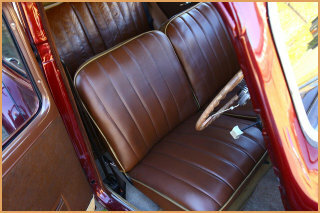 However, once done this looked like new leather as the colour was perfect and we needed the the front seats that we re-trimmed to match the old rear seats. To achieve an aged look we sprayed an additional colour, very finely over the surface to darken the leather down. The two re-trimmed front seats have been put back into the car and perfectly match the rear seats re-taining the authenticity of the car.